Originally published in Beirut in 1984, this multipage epic brings to life many of the political issues that have plagued the Mideast for most of this century. Set in an unnamed gulf country that could be Jordan sometime in the 1930s, the novel relates what happens to the bedouin inhabitants of the small oasis community of Wadi al-Uyoun when oil is discovered by Americans. Seen through the eyes of a large and varied cast of bedouin characters, the upheaval caused by the American colonization is shown in various manifestations, from the first contact with the strange foreigners ("Their smell could kill birds!" observes Miteb al-Hathal, who later leads a rebellion of Arab workers when the village of Harran has been made into an American port city) to confused and suspicious descriptions of the sinister "magic" tools brought by the Americanswhich are in fact bulldozers, automobiles, radios and telephones. The story unfolds at a stately pace over a timespan of many years and provides an endless stream of characters and events, each connected to the next by many threads of plot. Theroux's sensitive translation conveys the subtleties of ambiguity and nuance inherent to the Arab language and culture. Banned in several Mideast countries including Saudi Arabia, this is the first volume of a planned trilogy by a Paris-based Jordanian novelist who holds a law degree from the Sorbonne and a Ph.D. in oil economics from the University of Belgrade. Despite the Lawrence of Arabia setting, Munif writes from a unique vantage point; English-language readers have been given few opportunities before now to look at this situation through native eyes. Banned in Saudia Arabia, this is a blistering look at Arab and American hypocrisy following the discovery of oil in a poor oasis community. Munif was born a Saudi national and brought up in Amman, Jordan to a Saudi father and Iraqi mother. In 1952 he moved to Baghdad to study law and later moved to Cairo. He received a law degree from the Sorbonne and a Ph.D. in oil economics from the University of Belgrade's Faculty of Economics. He later returned to Iraq to work in the oil ministry and became a member of the Ba'ath Party. He began writing only in the 1970s after he left his job with the ministry, quit the Ba'ath party, and moved to Damascus removing himself from a regime he opposed. He quickly became known for his scathing parodies of Middle Eastern elites, especially those of Saudi Arabia, a country which banned many of his books and stripped him of Saudi citizenship. He used his knowledge of the oil industry to full effect criticizing the businessmen who ran it and the politicians they served. The author of fifteen novels, his masterwork is the Cities of Salt quintet that followed the evolution of the Arabian peninsula as its traditional bedouin culture is transformed by the oil boom. The novels create an entire history of a broad region, evoking comparison's to William Faulkner'sYoknapatawpha County. The quintet begins with Al-tih (1984, Cities of Salt) in the desert oasis of Wadi al-Uyoun that is disrupted by the arrival of western oilmen in an image similar to that of the disrupted village of Chinua Achebe's Things Fall Apart. As Achebe described the effects on a traditional African village of the arrival of powerful missionairies, so Munif chronicles the economic, social, and psychological effects of the promise of immeasurable wealth drawn from the deserts of nomad and oasis communities. The quintet continues with Al-ukhdud (1985;The Trench),Taqasim al-layl wa-al-nahar (1989; Variations on Night and Day), Al-munbatt (1989; The Uprooted), and Badiyat al zulumat (1989; The Desert of Darkness). Daniel Burt, in his The Novel 100, ranked the quintet as the 71st greatest novel of all time. The last novel in the series has not been translated into English. While his works were never particularly successful in the west, throughout the Middle East they are both critically acclaimed and extremely popular. 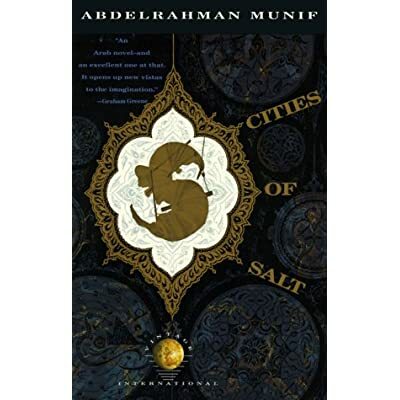 Cities of Salt has been described by Edward Said as the "only serious work of fiction that tries to show the effect of oil, Americans and the local oligarchy on a Gulf country." While he was one of the fiercest critics of Saddam Hussein and his regime, he was utterly opposed to the American invasion of Iraq and spent the last two years of his life working on non-fiction projects to oppose what he saw as renewed imperialism.